Well, hey there good lookin’. Good morning, good afternoon, or good evening. Which ever it may be. Thanks for taking time out of your day to join me and this saucy, creamy, smokey, flavorful, hearty chicken filling of wonder. Kids like it. Dads like it. Moms like it. Your dog may like it. (If I had one I would have given he or she a taste test, my apologies for insufficient data.) Your Grandma may like it (it’s not overly spicy, ok?) I bet your neighbor would like it, or your mailman, or the gal in the apartment next door. It’s a good one, my friends. Hope you make some today. Here’s a little shot of two ingredients used in this recipe that you may not have on hand. Let me give you a little tip. Get them on hand. You won’t be sorry. They are both fairly new seasonings to me and I can’t seem to get enough of either of them. Sometimes I go to my cupboard and just take a big sniff of the Smoked Paprika. How can a little red powder smell so good! Seriously, I am that weird. Try not to hold it against me, okay? The Chipotle Peppers in Adobo Sauce are also wonderful and pack a lot of flavor. You won’t ever need the whole can for a single recipe. So as not to waste, open up the can and then blend it up. (The contents of the can, not the can.) Then place the blended Chipotles into a small freezer safe ziploc bag. Label it, and pop it into your freezer. You’ll have it handy to break a piece off and pop it into a recipe or two. Ok then, let’s cook the chicken shall we? 1. Place two chicken breasts (you can use frozen) into a large skillet. Pour a can of Mexican Stewed tomatoes over the chicken. If you are using whole tomatoes, take some scissors and cut the tomatoes into small pieces. 2. Pour 3 cups of chicken broth into the pan. Over high heat, bring the ingredients to a rolling boil. Reduce the heat to medium high and cover the pan with the lid at an angle to so that some of the steam can escape. Let the old girl cook until the chicken is cooked through and no longer pink. Should take about 15-20 minutes depending on how thick the chicken is. 3. Remove the chicken to a plate and let it sit for about 5 minutes. Keep the juices in the pan cooking at a simmer. 4. Chop the chicken into small chunks with a sharp knife. 5. Carefully place the chicken back into the brothy skillet. 6. Rinse and drain one can black beans, one can corn and one single can of green chilis. Add them to the skillet. and 1/2 teaspoon of chopotle peppers and adobo sauce. 8. Give it all a nice stir so the cream cheese can melt and all ingredients can get incorporate. 9. Let it continue to simmer over medium high heat for about 10 minutes to allow the ingredients to heat through and the sauce to thicken up just a bit. Give it a good stir occasionally. 10. Place a nice helping of the chicken filling into the center of a large flour tortilla and fold up the sides. and vwalla. A quick dinner of wonder at your finger tips. and dunk some tortilla chips into it as a tasty dip. Either way, it’s good as gold my friends. Hope you enjoy it! This sounds SO good! It's going on my “to make” list immediately! I have yet to make one of your recipes that my family doesn't absolutely love and I'm sure this will be another winner. Thanks for giving me so many great things to do with chicken. I get burnt out on the same old same old and we eat A LOT of chicken around here. Do you think I could crock pot this and add the cream cheese at the end? Yes, the crock pot would work well for this recipe. Place all the ingredients, but the cream cheese in, cook on high for 4 hours then add your cream cheese give it a nice stir until it melts and is well incorporated and then cook for another 30 minutes or until it's all heated through. Good luck! Hope you love it. I would assume it would be okay on low for 6-8 hours? Can't wait to make this one . . . and I do happen to have both those ingredients on hand – thanks to trying out other new recipes. They really do make a difference in the recipe. Yum! This would go great with my homemade chipotle flour tortillas! You are right, blend up the entire can of chipotle and freeze it; that's the way to go! We had this for dinner last night and it was AMAZING!!! Another GREAT recipe Jamie! Thanks again! I made this last night and even my picky 9 year old ate it! I didn't tell him about the tomatoes (told him it was part of the spices) and he ate them 🙂 Thanks for sharing! Hi Jamie–I really want to try this recipe but I'm having a hard time finding the smoked paprika. I've looked in all the large local supermarkets around here (I'm in Northern CA). Did you find it in your supermarket or a specialty store? If in the supermarket, would I find it with the spices or in the aisle with the Mexican foods? Thanks so much. Love all your recipes! I bought my smoked paprika at Costco. I have seen it at regular grocery store chains with the other McKormick seasonings. Sorry you have been having trouble finding it! I know that can be so frustrating. Good luck! Furrealz? That’s mavlelousry good to know. Thanks for the great tip about the chiles. I have bought these before and they ended up spoiling in the fridge because the can holds so many chiles. Last time I bought them I did freeze the individual chiles to use but blending them up first makes them so much easier to put in recipes. I have this on the stove right now – can't wait to taste it! 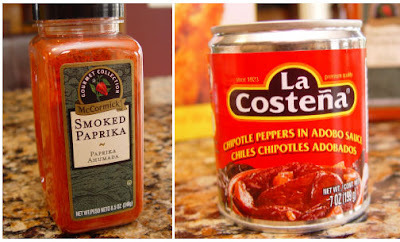 I've had a difficult time finding Smoked Paprika as well – finally located it at Cost Plus World Market. I'm so glad you enjoyed the taste of the recipe. Next time try cooking it without the lid on for the entire time. Hopefully if will give you a shorter cooking time and help the broth to reduce quicker. Good luck! Just want you to know I made this recipe yesterday and loved it. I wanted to know what else you use the peppers in adobo sauce for. I loved the smell of it. I also had the same problem with it being too think, but it tasted delicious. I can't wait to try out more of your recipes!! I eagerly made this recipe last week. It “forced” me to buy ingredients that I always want to but just never seem to buy (smoked paprika, chipotle peppers, black beans.) I, too, found that the end result as made per the recipe was too “soupy” to use as a filling for tortillas and a little drippy as a dip. Glad to see that it wasn't “just me.” Serendipitously, I found that what makes for a creamy yet overly soupy tortilla filling makes for a creamy and PERFECTLY soupy… SOUP! So I switched gear(s), ladled up a bowlful, sprinkled a crunched-up handful of tortilla chips on top, and dove in. Next time I make it, and there WILL be a next time, I will use less chicken broth and/or cook it without the lid… or maybe I'll just make soup again. OMG- I've got to make this one this week. Great Job!! Liz, you are too cute. Why don’t you vlog more?? The Chicago Dog is adorbs and I do have to say I’m tifierred of the impending kids parties I’ll be dealing with for years to come. I made this for dinner tonight and it turned out soupy too. I am letting it simmer a bit more, in hopes that it will thicken up. It's definitely too soupy. Wish I would have read the comments before I made it. I think 1 cup of broth to start with would be much better. YUM! I just found your blog and will be making these soon! I didn't see this in the comments so I'm wondering if this would be a good freezable meal? I'd make the filling and fill a tortilla and freeze them individually. I'm trying to find quick, yummy lunch ideas and wonder if this would work! This will freeze very well, especially if you roll it into tortillas first. Good luck! Hope you love it. This was a hit at my house tonight! My husband likes his food spicy, so I added some cayenne pepper and doubled the chipotle mixture. The flavor was bold and rich. It was quick and easy to make, which is perfect for our busy household. I will definitely be making this one again! I don’t think that I ever commented on this recipe but we love it and I make it all of the time! Just had it for dinner last night actually. I usually make it in the crockpot–we love it in tortillas or with chips. So good! What’s the difference between smoked paprika and regular paprika? Smoked Paprika has this amazing smokey fragrance. It’s fabulous, fabulous, fabulous. Hi Jamie! I really enjoy your website, I like how the recipes are family-friendly! Weare busy with a family of nine, so it helps when a recipe is easy, wholesome, and tastey. I’ve got a question about using the frozen chicken in your recipes: do they need thawed or can I just put them in frozen and if I put them in frozen do I need to adjust how much liquid a recipe calls for? Hi Jamie! Will I need to adjust the amount of liquid added to a recipe if I use the chicken frozen as compared to if its thawed out? Brandy – I’d imagine you just need to increase your cooking time or thaw out your chicken ahead of time. I came across this recipe again on my Pinterest when I was looking for ideas for the chipotle peppers in adobo I have left from making chili last night. I’m going to try it but reduce the broth like others have mentioned! I just made this without reading the comments as well, it was soupy like everyone said. I let it simmer about 30 minutes to cook it down, and although it was still a bit runny I let it cool and it thickened up as it cooled down! great flavor! I used pinto beans instead of black beans since thats all I had on hand and it was great! We’re a family of two, so I froze a good amount for a future easy meal. I think this would be great placed over a bunch of salad greens, for a change of the chicken fajita salad I normally make. Just one more way to get veggies in our diet. Followed directions precisely and came out very soupy. Next time I will use 1 cup of chicken broth. Very tasty though, will make again! I made this tonight. I used 1 1/2 cup of broth and a tiny extra peppers in adobo sauce. My kids and husband liked it and I had a little left over for lunch tomorrow. I gave them the option of chips or tortilla. This was wonderful and so easy. I did use half of the broth and it turned out great. I will definately make this again. And thanks for introducing me to Smoked Paprika! This was so delicious! I was unable to find smoked paprika at our local grocery store (I live in a very small, rural community), but I doubled the chipotle to make up for it. I’m hoping to get smoked paprika on my next trip to a “real” grocery store so I can make this again and again and again and again and again. Like, every day. Looking forward to trying more of your recipes! Just made this today in the crock pot and it was yummy. I did not put in the chicken broth and it was still very soupy. So I dipped out the soup part and will freeze for a later day to make homemade soup with. Everyone loved this!